This is the 24th square of the 30 square Knitterati Afghan. The afghan commemorates Cascade Yarns® 30th anniversary. The 30 squares will be released throughout 2017 as a mystery knit-along. Cascade Yarns® will be making a donation to the American Red Cross equal to the amount that it receives from Ravelry for the sale of this pattern. Although not a fiber-arts related charity, we feel compelled to donate the net proceeds from Knitterati blocks 21-25 to The American Red Cross in support of those affected by Hurricane Harvey. The American Red Cross prevents and alleviates human suffering in the face of emergencies by mobilizing the power of volunteers and the generosity of donors. When a hurricane or tropical storm strikes, your donation helps the Red Cross provide shelter, food and comfort to families. The American Red Cross is working around the clock along the Gulf Coast to help the thousands of people whose lives have been devastated by Hurricane Harvey. This highly textured medallion is worked in the round from the outer edge. 20 sts x 28 rows = 4” (10 cm) over Stockinette stitch using size 7 (4.5 mm) needles. 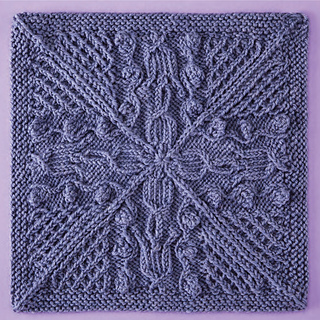 For additional tips and helpful videos for this square visit: Cascade Yarns® Block 24 Project page.